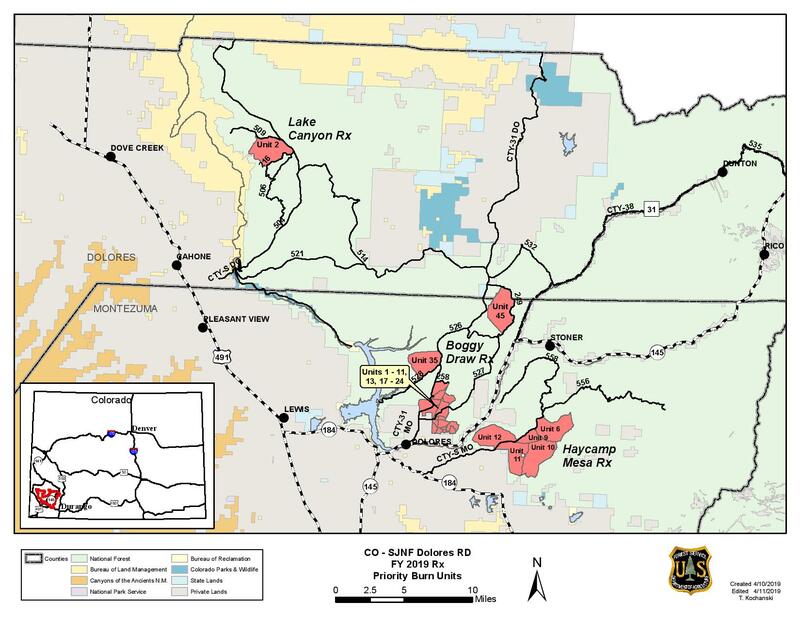 Hours: Monday - Friday 7 a.m. - 3:30 p.m.
Dolores, Colo., April 11, 2019 –The Dolores Ranger District, San Juan National Forest is planning to conduct several prescribed burns starting in mid-May. Burning operations will take place over multiple days when weather and fuel conditions are favorable. Both hand and aerial ignition methods may be utilized, and continue throughout the summer and into fall based on conditions. - Lake Canyon, 2700 acres, located 12 miles east of Dove Creek, west of Forest Service Road (FSR) 504 and adjacent to FSR 216 and 509. - Boggy Draw, 6127 acres along FSR 526, 527, 528 and 529. - Haycamp Mesa, 3400 acres, east and south of FSR 556 and north of FSR 557. Burning operations will be conducted by Forest Service personnel, assisted by fire resources from cooperating agencies. During burning operations, smoke will likely be visible from areas around Mancos, Dolores, Dove Creek, Cortez, and HWY 491 between Dove Creek and Pleasant View. Smoke may settle into low lying valleys, and the Dolores River Canyon overnight. Smoke monitoring will be conducted, and ignitions will be scheduled to minimize smoke impacts to communities. This effort will reduce hazardous ground fuels, lessen the risk of unplanned large scale wildfire, help restore ponderosa pine ecosystems, and improve wildlife habitat. Prescribed burning operations will begin only when weather, fuels and smoke parameters are met. For additional information, please contact Matt Traynham, Assistant Fire Management Officer (Fuels), Dolores Ranger District (970) 882-6838.